Monthly murder, mystery, intrigue, and more can now be delivered to your doorstep – from the mind of a serial killer. ‘Hunt A Killer’ wants to know if you have what it takes to to stop this murderer. The subscription box entertainment model is nothing new. Dozens of services like Loot Crate, Disney Princess Pleybox, Funko Disney Treasures, Marvel Collector Corps, Star Wars Smuggler’s Bounty, and many others offer themed packages of collectibles for fans to enjoy on a regular basis. Taking the service a step further, companies like Mysterious Package Company offer intriguing, bizarre and sometimes macabre monthly deliveries for recipients to dig into a story amidst the assortment of items that arrive. Enter Hunt A Killer, a monthly interactive adventure centered on solving crime. This killer service ships clues and puzzles on the 22nd of every month. 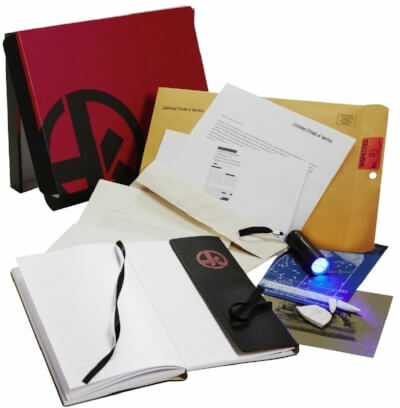 Included in the package are sleuthing tools, eerie items and puzzles that are part of the mystery, and creepy letters from the “killer” himself. The adventure is an ongoing story arc with each month delivering another dark chapter. Want even more interaction? There is a live, interactive version of their macabre murders. The next event happens in Darlington, MD, October 6-8th. Tickets for the event go on sale June 1st at 10 am. Visit their website for details. A rather intense and somewhat not-safe-for-work video teasing the event is available. Hunt A Killer offers the option to take on the killer yourself or send a subscription as a gift. You can receive monthly mailings or a one-time package with free shipping in the U.S. Membership (free) is limited to only 250 new members a week to ensure quality of items sent in the subscription service. Individual packages run $30 a month, a six month subscription will cost $27.50 a month and a one year plan is $25 per month. Monthly subscriptions can be paused or canceled if needed.